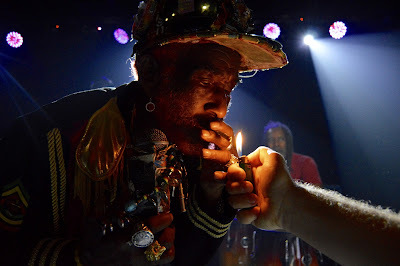 Jamaican reggae dub legend Lee "Scratch" Perry returned to The Riot Room on Thursday night. Perry -- who is now 80 years old -- sang and toasted while strolling across the stage for over an hour. His vocal performance was less than stellar, but his claim to fame mostly comes from his massive influence over production techniques and his unique, near-cryptic lyrical chants. Perry didn't play with the highest amount of energy either, but the energy was undeniably light and fun-loving. Fans were charmed by his colorful cap, "boots," and jacket adorned with a gaudy amount of knick-knacks and his freestyle toasts mid-song that ranged from "I drink the Guinness," to "Kick Donald Trump in the rump," punctuated by Perry swinging a foot high in the air. To an outsider of the genre his show may not hold much appeal, but any fan of dub music should certainly see Scratch at least once. The show was opened with a stripped-down set by members of 77 Jefferson and selections by Rico Dejoie of Boss Hooligan Soundsystem.